Hard-hit by Hurricane Michael’s devastating winds and cut fiber lines, Bay County, Fla. saw little improvement yesterday in the number of cell sites that were down, going from 216 the day before to just 214, but this afternoon there was a marked improvement in service as the dominant carrier in Panama City and Mexico Beach, Verizon, brought service back to thousands of subscribers. Verizon said last evening that it was able to restore service in four major cell sites in Mexico Beach and around Panama City, but fiber outages and new cuts were holding back complete resoration. “Hallelujah,” exclaimed Mexico Beach Mayor Al Cathey today when his Verizon phone started working for the first time in nearly a week. But the good news was thwarted by a tragedy after emergency workers confirmed today that a search dog had discovered the body of a man in Mexico Beach’s community-wide rubble of hundreds of homes. That death brings the total deaths from the storm in four states to 20. 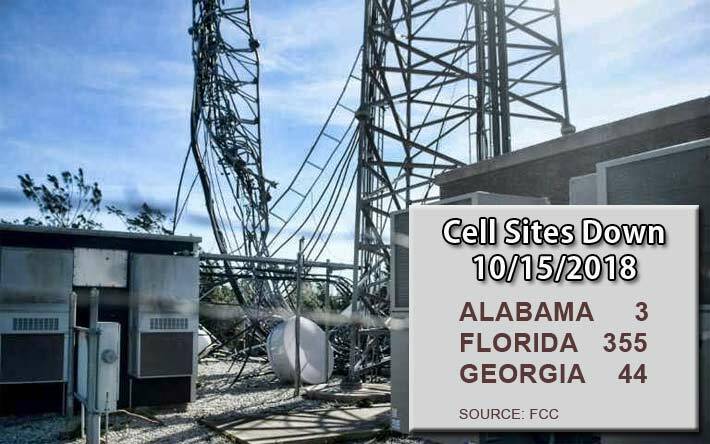 Alabama’s cell site outage has dwindled to just three sites out of service. Georgia is down to 44 sites, representing 10% of its 4,447 sites in the counties being monitored by the FCC. Florida still has over 14% of cell sites down in the affected areas representing 355 of 2,543 total sites.